Bill's review confused me greatly, since my Airfix kit didn't look too bad, and dry-fitted reasonably well. It's not a great kit, but it looked far from unbuildable. It took a long time before it became clear where the confusion originated. 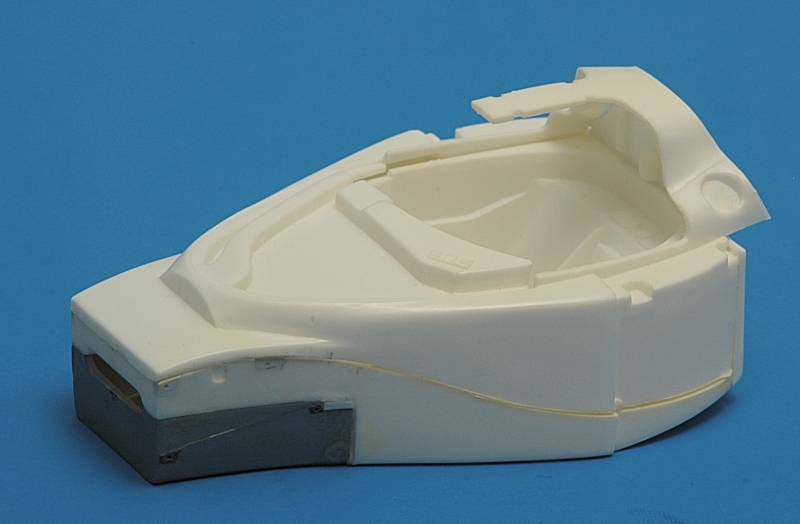 It appears that there is a large quality variation with this model, both in the Heller and Airfix packaging, and that this can be attributed to the injection molding process. This process has lots of variables, such as mold temperature, material temperature, pressures at several stages of the process, and injection and cooling times. Mike Kendel commented that problems 1 through 6 all could be caused by the injection molding variables. Even with a perfect mold, the wrong set of variables can produce bad products. Back in 1992/1993 when this kit came out, Heller did all the molding of Airfix models. It can therefore be assumed that both the Heller and Airfix versions were made in the same injection molding plant. 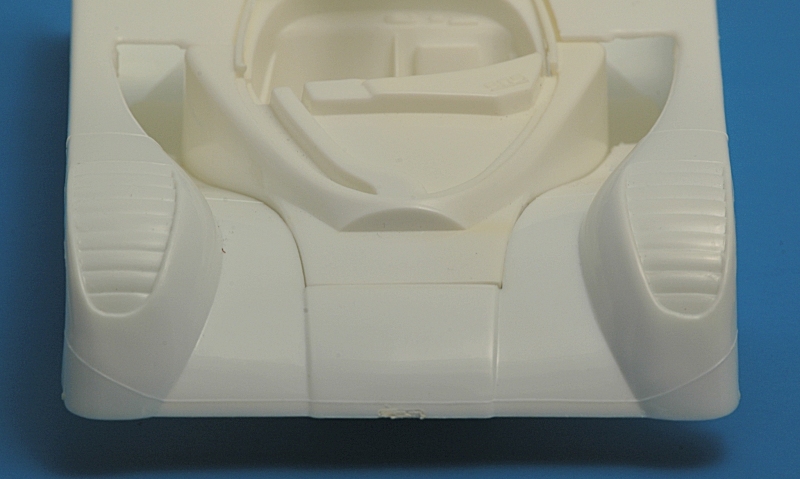 Possibly the kit's molds required a very specific set of settings, and that these were not always adhered to. It's most likely that Heller produced good and bad batches of this model. 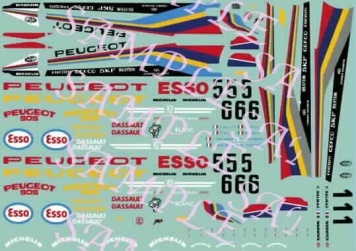 On the 15th of October, 1992, the injection moulding machines in our factory produced the first set of parts for the 1:24th scale Peugeot 905 EV1 Mark 2 [French text says EV1bis]. This vehicle is the very latest state of the art in sports racings cars and it shows that we, at the Heller company are always in the forefront of the model industry with new kits. 3 days later, on the 18th of October at the Magny Cours race track, Mr Jean Todt, Director of Peugeot Sport, was presented with the first completed model. 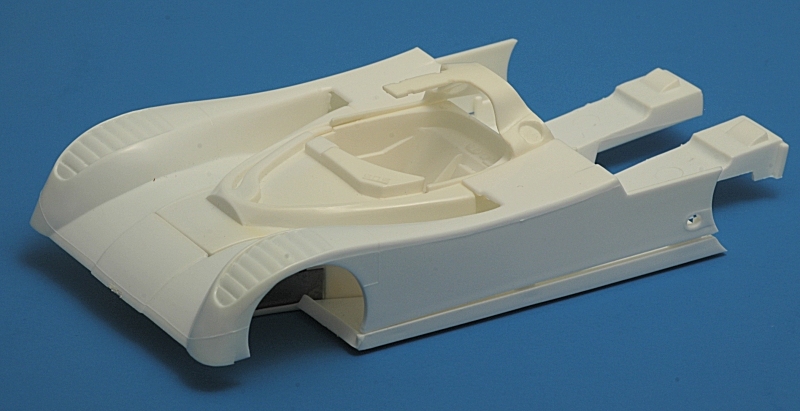 The initial idea to produce a model kit of the car to final production took 7 months, an amazing number of hours had to be dedicated to the project to get every detail correct. 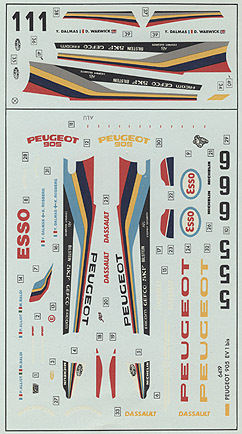 4 visits to the Peugeot Talbot Sports factory were required by our research team and then 800 hours of computer aided design to produce a full range of drawings from the rear spoiler to the v.10 engine. It then took another 3,000 hours to manufacture the mould tool of 95 parts, which includes 41 for the engine alone, to the highest standards of precision. Each year we endavour to produce better and more accurate kits so that our models become "always true to life". I shot the following photographs of my dry-fitted model to show that points 1-3 and 5-6 don't apply to my Airfix kit. Bill Via commented: "My two examples were NOTHING like the photos of yours". The monocoque has the front suspension attached, and that makes sanding after assembly difficult. I removed the upper and lower wishbones from the monocoque parts, and put pins in the wishbones for easy reassembly. Then I assembled the two parts that form the lower side. 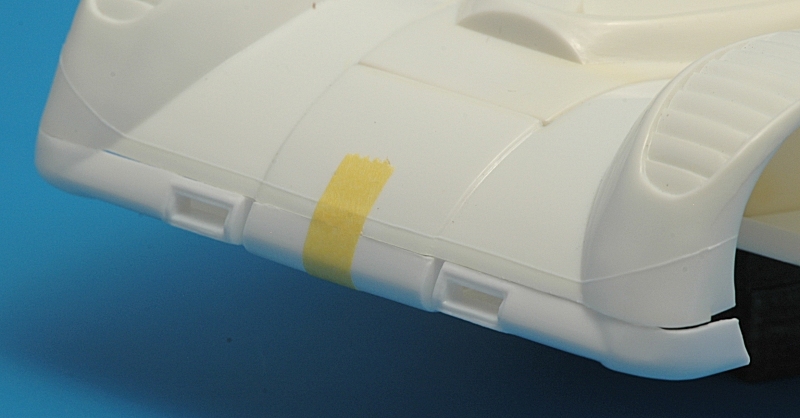 The main bodywork fits relatively well without tape. Closing the gap between the sides and the floor deforms the floor slightly. The monocoque could be slightly too tall (point 4), so maybe this can be solved by removing around 1 mm of the monocoque's height. As far as I can see, the engine will accept this drop too, since there is some space between the sump and the floor panel. The body has substantial mould lines on the sides. Some gaps exist between the monocoque and the bodywork. It looks like the monocoque is pushed to one side of the opening, which will require some fine-tuning. The louvers on the front fenders are not too bad, but I'm pretty sure they extend to far forward. They are also set too deep: they should extend slightly from the fender contour in side view. Subsequently, in side view the front fenders look flattened in the louvre area, it's not a continuous curve. That cannot be corrected if you want to retain the louvers, but if you're building a Le Mans car without louvers, you should build up that area. Similarly the wheel opening is not round but flattened at the top. The rear edge of the wheel opening must be rounded off. The lower nose part (#14) was described in one review as being 2 mm oversize on both sides. Yet it fits relatively well here, but it does require a cut somewhere to fit properly. The rear bodywork fits reasonably but could use some fine tuning. A closed engine cover will help immensely, and will save a lot of time detailing the engine bay. 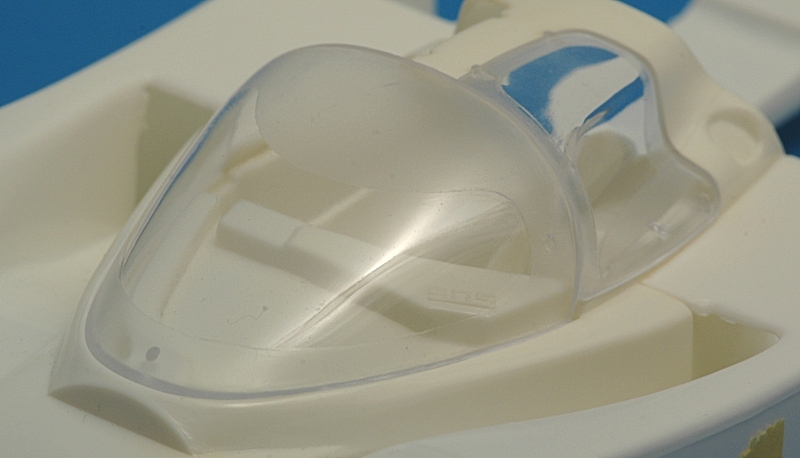 The transparent parts fit well, except for the door window, which shows a step on the rear side. 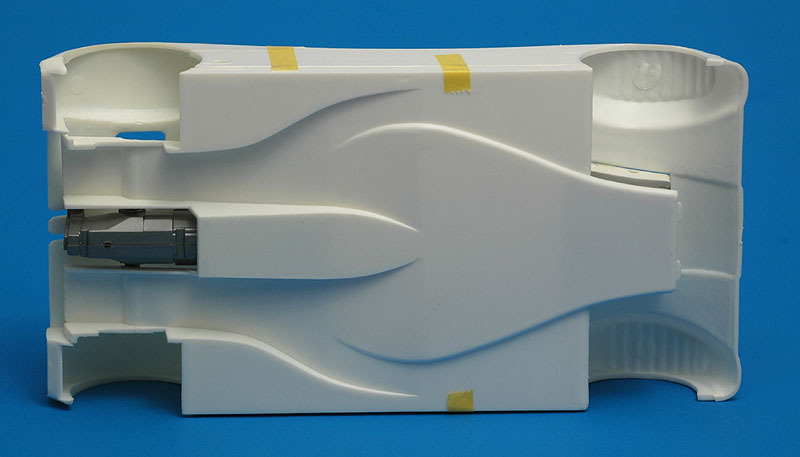 The engine air inlet also fits well even when just dry-fitted, contrary to complaints by other modelers. The key might be that the engine is to be glued against the back of the monocoque, and not to the floor panel. This causes a small drop of the engine. The floor panel seems to lack a cover for the gearbox and some vanes in the tunnels. Unfortunately there are very few photos of the lower side. In 2018 I was able to study the underside of a 905 Evo 1c jacked up to hip level. I assume the Evo 1c floor panel was the same as that of the Evo 1bis. It turned out that the pear-shaped area between the front axle and the start of the tunnels does not exist - the floor panel is completely flat there. 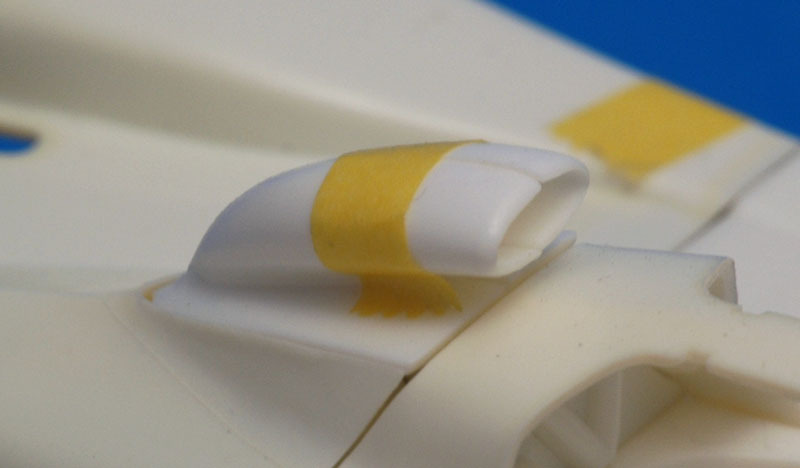 The easiest solution is gluing 1.2 mm plastic card in the 'raised' areas, down to the rear axle. At the sides, there are horizontal strips that stick out of the car's plan view a few centimeters. The shape of the venturi tunnel entries is wrong too: it should be one continuous curve instead of the one shown that changes direction (for lack of a better description). I've sketched a rough drawing of these details. The whole floor is yellow aramid / Kevlar fiber, with the exception of the rear 80% of the tunnels. There are skid blocks in several places. The wheels fit perfectly in the tires, but lack a locking nut. 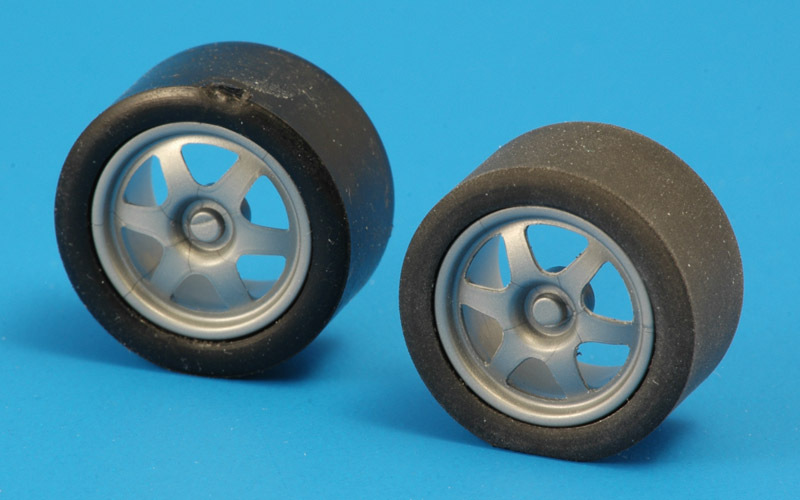 The tires are glossy and feel like plasticised plastic. A good way to deal with tire problems is to give the tire a flat spot at the sprue attachment point. This avoids the car 'standing on its toes' and eliminated the sprue attachment. The tire can be scuffed with Scotchbrite, which transforms the shiny plastic to a rubber color and texture. After this the tires actually look pretty good. However they attract dirt like crazy! There is some debate whether the model represent an 'Evo 1' or 'Evo 1 Bis'. The problem starts with the question whether there ever was an 'Evo 1'. 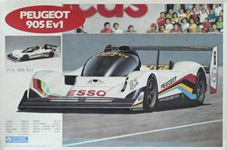 The book 'World Sportscar Racing '91' from late 1991 calls the model introduced at the Nurburgring race on 18 August 1991 already an 'Evo 1 Bis'. This suggests an 'Evo 1 sans suffix' was not raced. 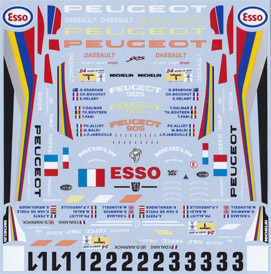 The model manufacturers contribute to the confusion by calling the same model 'Ev 1' (Airfix, Gunze Sangyo) and 'Ev 1 Bis' (Heller) on the box top. In 1993, parts of the never-raced 905 Evo 2 were fitted to the Evo 1 bis, including transverse gearbox, rear suspension, bigger tunnels. The bodywork bulge around and behind the engine became larger and rounded. The rear brake inlets moved inboard a bit. The exhausts were rerouted from the sides to the venturi tunnels. This version is sometimes referred to as the 'Evo 1c'. 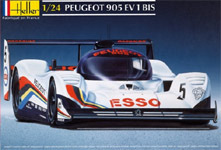 However, the designations that Le Mans Miniatures uses for their models is 'Evo 1' for the 1992, and 'Evo 1bis' for the 1993 model. 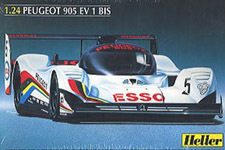 Heller started producing their kit in 1992, which includes decals for a 1991 car, and the box says 'EV 1 BIS'. That shows that the 'Evo 1 bis' designation was already used in at least 1992, and not from 1993 on. Based on this information, I believe the model correctly represents an 'Evo 1 bis' version. To my eye, the bodywork looks too square. At least around the front and rear wheels, the transition from side to top should be made more rounded. The spokes of the wheels have a half-round cross-section, which makes them appear infinitely thin from the outer side. The real spokes have a rectangular cross section. I checked the fit of the kit tire in the wheel opening, and the wheel/tire looked a bit too small. Or maybe the wheel opening should be reduced by gluing a strip of plastic around the edge. 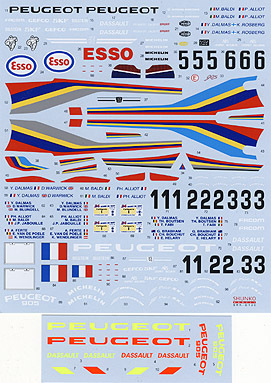 The many red arrows on the decal sheet point to quick-release fasteners that can be represented by small photo-etch parts (or similar). All bodyworks fasteners are recessed. 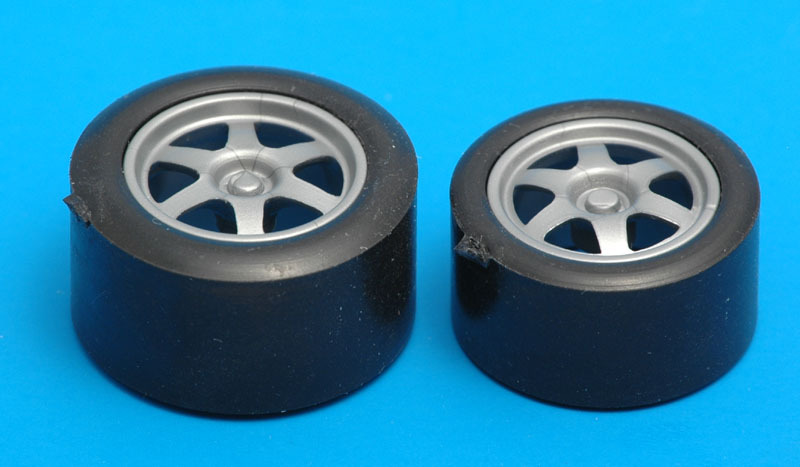 Profil24 produces two resin 1/24 905s: 1992 Le Mans Evo 1B (P24004) and 1993 Le Mans Evo 1B (P24005). They are curbside models without engine details and a one-piece body. They feature headlights and the front fender louvers are closed but positioned correctly. It is reported that the model is based on the Heller/Airfix kit, but a couple of parts are integrated and some are changed to meet new specs. For example, the 1993 version has an extended bulge on the engine cover, the exhausts are deleted from the sides and the rear brake inlets are closer to each other. It is reported that the Profil 24 models are more accurate than the Heller/Airfix kit. One improvement that I see is that the main inlets are wider, and partly go under the top of the body. Also, these models have details of the pins and clasps that fix the removable bodywork parts on the 1:1 car. 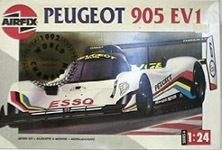 Spark / Redline issued a 1/24 die cast Peugeot 905, the Le Mans 1992 winner (catalog number 07-2008). This model is based on a Le Mans Miniatures master. Peugeot Museum in Sochaux, Peugeot 905 Evo 1 bis (Le Mans winner 1992), Peugeot Evo 2. Chassis numbers EV12 and EV 17 are reported. Around 2011, some cars appeared on the tracks again, for classic racing. The following was compiled from limited data, so it might not be 100% correct. AGS on the Castellet circuit owns EV13, and it is available for driving. Possibly it was sold on. EV14 was offered at an auctioned in 2009, but the reserve price was not met. I saw EV14 racing at Spa in May 2016. The decals in the Gunze kit appear to be identical to the Airfix decals, but maybe they were printed by another decal printer?